On May 7, 1945, the German forces unconditionally surrendered to the Allies, at the order of General Alfred Jodl, who signed the agreement at Reims. After that, it was up to the Allies to take over governance of the defeated German state, including handling the printing of postage so that letters could still be sent. Venezia Giulia was a region located in the northeast corner of Italy; at that time, it intersected with what was referred to as Yugoslavia in 1945. 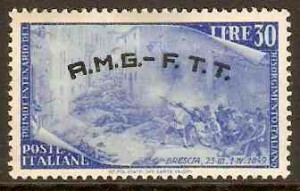 This area had stamps that were created by applying an imprint over the local stamps bearing the AMG-VG sigil. To learn more about these and other stamps of this timeframe, contact Treasure Coast Stamps. We are happy to assist you with all of your stamp collecting needs.